pumpkin white bean bars | rocket ship go! I was inspired by Celine’s blondies, and immediately after making black bean brownies I got the idea for these tasty morsels. I didn’t like the way that the banana overwhelmed the chocolate flavor in the blackies, so I was thinking of what to replace it with… and pumpkin came to mind. Then you modify the spices, use white beans (cannellinis) instead of black… and you got yerself a really delicious, pumpkin-pie-tastin’ treat! Preheat oven to 350F. Lighly oil an 8×8-inch baking pan. Pour into the prepared pan and bake for 15-20 minutes, or until the top appears dry and a toothpick inserted in the middle comes out dry. Let cool. 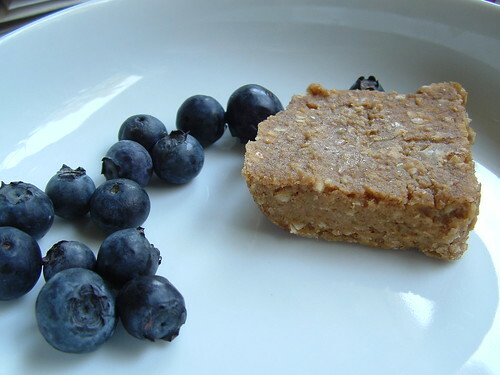 Cut into squares with a knife, and place pan in the fridge to cool completely before removing. Never have I craved white beans more than now. Now THOSE are enticing – yum! You’re a genius – pumpkin blondies sound delicious! I love white beans a lot anyway, so it’s be pretty amazing to have them for dessert. that’s absolutely brilliant! and for some reason it sounds a lot more appetizing to me than black beans and chocolate. Yum! I’ve got to try these! Those look awesome – what a great idea! I make cookies with cannellini beans, but I never thought to put them in brownies! Thank you for the nice comment on my cakes! I usually tend to lean to the cleaner designs too, although sometimes I get brides who just want something funky. I try to look at it as a challenge – if I make a design that I wouldn’t necessarily choose, it makes me break out of my comfort zone. But if it were up to me, they would all be simple, clean designs! These are absolutely delicious…just the right balance of pumpkin, coconut and spices…I plan to heat them up in the microwave just a bit and top them with vanilla soy ice cream and a cranberry sauce. Thanks for the great recipe! I’m annoyingly commenting here about older posts, because I don’t know how far back you check for comments. Sorry in advance! Blend everything in a blender/food processor until completely smooth. Pour into a saucepan and whisk over medium heat until thickened. Add a dash of black pepper, and taste for salt/lemon. It’s based off the “Nacho cheeze sauce” from Jennifer McCann’s blog (of Vegan Lunchbox – recipes are at Shmooed Food) which I think in turn is based of something else. It’s so easy and so good, I hope you like it! Also on green smoothies: I actually find I prefer a non-sweet smoothie if I want to get a lot of green stuff in there. I add half a cucumber and lots of lemon and/or lime juice for a cool/sour smoothie instead of sweet when I’m adding lots of lettuce, kale, and/or spinach. By the time I add enough fruit to my green smoothie to make it as sweet as I want, it’s usually not really a green smoothie anymore. Ha! I’d love to try that nooch sauce. I’ve been trying to get back into green smoothies, so I’ll have to try your suggestion. Thanks for the comment! Can I use rice flour instead of oats? Hmmm, I dunno, I haven’t made this recipe in a while. You should try it! 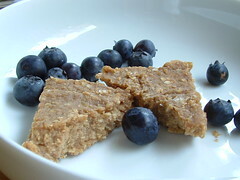 Actually i will try it with the oats and replace the buckwheat with the rice flour. I am tying to make it GF. I will let you know howit comes out!